VietPress USA (Mar. 15, 2018): The Washington Post reported that the White House had signaled it was open to a “three-for-three” deal, which would have allocated about $7 billion — or three years’ worth — of border wall money in exchange for a three-year renewal of the Obama-era DACA program, but this time with full congressional authorization. But today Trump administration denies this. President Trump does want to see funding for his border wall included, but doesn’t think it should be tied to legal status for “Dreamers,” spokesman Raj Shah said. The White House said Wednesday that President Trump opposes cutting a deal with Congress to protect young illegal immigrants from deportation for three years in exchange for three years of funding for a border wall. Mr. Trump does want to see funding for his border wall included, but doesn’t think it should be tied to legal status for “Dreamers,” spokesman Raj Shah said. “Securing the border is one of the most vital functions of government and is a core part of any routine funding bill,” Mr. Shah said in a statement. He was shooting down a Washington Post report that the White House had signaled it was open to a “three-for-three” deal, which would have allocated about $7 billion — or three years’ worth — of border wall money in exchange for a three-year renewal of the Obama-era DACA program, but this time with full congressional authorization. “The White House opposes a so-called three for three deal,” Mr. Shah said. Sen. Jeff Flake, Arizona Republican, had floated the three-for-three deal during last month’s immigration debate. 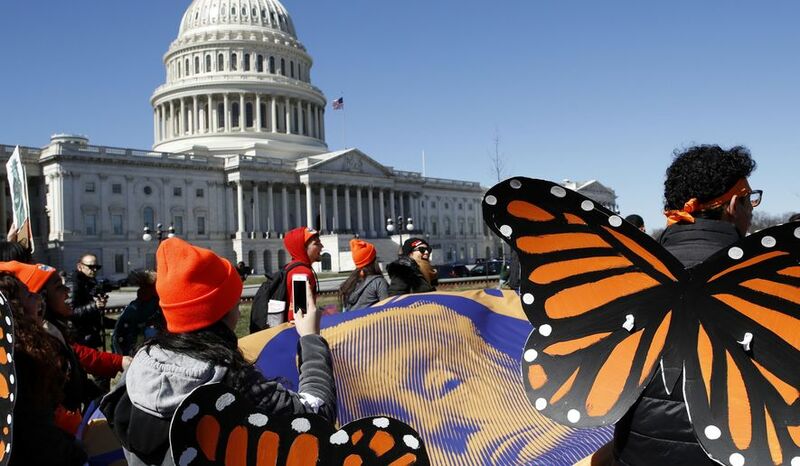 The White House had rejected it at the time, saying it was looking for a full, permanent legal status for as many as 1.8 million Dreamers, in exchange for $25 billion in new border funding and major policy changes. The Senate stalemated on that proposal as well as several others, and the House has yet to tackle the issue at all. Adding DACA to the looming “omnibus” spending bill, which Congress must pass by March 23 to avoid another government shutdown, would have been complicated. Some GOP lawmakers would have balked, opposing anything that smacks of an “amnesty” for illegal immigrants. Meanwhile more than 80 Democrats signaled they wanted an even broader legalization — a generous pathway to citizenship for more than 2 million illegal immigrants — to be attached to the spending bill. And they said they will refuse any money for new border walls or fencing. “We want a clean Dream bill that we can vote on,” said Rep. Luis V. Gutierrez, Illinois Democrat. The Democrats also said they want to see the spending bill cut money from detention beds and staffing at U.S. Immigration and Customs Enforcement, which handles deportations. Mr. Trump, meanwhile, has called for large increases in both of those areas.